There are three eras of Selesnya in Standard – and all of them have convoke. What does this have to do with anything? With Guilds of Ravnica bringing convoke back, we have a controlled experiment available to compare Selesnya eras. And we have the perfect format for comparison in Eternal Brawl: create a Brawl deck for each Standard environment that included Selesnya, make convoke a focal point of it, and see what you like best! I’m about to do that in this article, with as much as Selesnya as is spoiled from Guilds of Ravnica at time of writing. While Tenth Edition has several classic multiplayer cards, like Abundance, Ninth Edition has two creatures that are massively helpful to a convoke deck: Weathered Wayfarer and Wood Elves. There is a very good deck available with Kamigawa/Ravnica Standard as well – Ghazi-Glare was a World Championship-winning Selesnya deck – but I’m going for maximum convokage, meaning Ravnica/Time Spiral Standard is what I want. 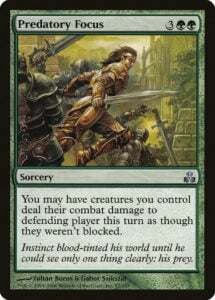 Of the two Selesnya commanders from Ravnica: City of Guilds, I prefer Tolsimir Wolfblood. I’ve seen Chorus of the Conclave create some massive boards, but Tolsimir being less mana-hungry makes him better at more stages of the game. Selesnya is great at making big board states and less good at recovering from board wipes or giving evasion, and that’s magnified in a card pool without Craterhoof Behemoth. Easily the best-known, most-played convoke spell. The nastiest surprise with Chord of Calling is Darien, King of Kjeldor, who can give you a surprise army as you take damage, but Aven Mindcensor has paired with Chord in Modern for years, and an end-step Seedborn Muse is always welcome. Congregation at Dawn is a non-convoke backup to Chord of Calling, lessening the need for raw card draw like Harmonize. Due to pinched deck spots, synergy board sweepers are often more playable in Brawl decks than a strictly efficient sweeper. Hour of Reckoning can be one-sided while efficient thanks to convoke. A nightmare in Time Spiral block Limited for its repeatability, it’s no less nightmarish in Eternal Brawl once the Saproling train starts sap-rolling. Potentially free combat tricks are worth a look; potentially free removal is worth a deck slot. The Selesnyan alternative to Bogardan Hellkite, it’s a blowout when timed right; if nothing else, it’s an Angel you can flash in post-sweeper. Soul Warden and Essence Warden were in Standard together, and they show up here both as lifegain sources and as convokers. Wall of Roots is available for its double-convoke trick with Chord of Calling, and I love the card regardless, so it’s in. Juniper Order Ranger is a house in this deck, while Saffi Eriksdotter and Loxodon Hierarch can protect the house. Weathered Wayfarer has a variety of great lands to search for, with Pendelhaven, Vesuva, and Vitu-Ghazi, the City Tree being the highlights. As noted, finishers are hard to come by for Selesnya sometimes, and Brawl decks need cards to punch through damage instead of sitting around on the ground. There aren’t many great trample effects in that Standard format, but there are good ways to give evasion. Akroma’s Memorial and Loxodon Warhammer are well-known; Nacatl War-Pride and Predatory Focus less so. But the latter two can bust open games in surprising ways – Nacatl War-Pride for making loads of attackers and forcing chump blocks, and Predatory Focus for sending combat damage straight to a player’s face regardless of blocks. If you ever cast Predatory Focus on a turn with Nacatl War-Pride, you’re living the dream. I like this deck a lot, although only one-third of it belongs to Ravnica block. It still gets at the heart of Selesnya gameplay while having a variety of good cards. But what’s available eight years later? The decision on which Selesnya leader to use is even easier here, as Trostani, Selesnya’s Voice is a good Magic card. And populate, the Selesnya mechanic in Return to Ravnica, works well enough with convoke supplied by Magic 2015, even though both are mana-hungry; the build will have to be careful about that. Here’s the list in full. There are loads of top-end options that didn’t make it in here, from Sylvan Primordial (never banned in Standard, so fine in Eternal Brawl) to Soul of Theros to Collective Blessing to Devout Invocation. But convoke and some of the activated abilities need mana, and card draw is hard to find for green-white in that Standard environment, so emphasizing ramp will result in a more consistent deck. In this case, there are the great green mana dorks of the era – Elvish Mystic and Sylvan Caryatid – plus the Modern-playable Courser of Kruphix and ramp spells Peregrination and Nissa’s Expedition. The latter has convoke; it joins Triplicate Spirits and the returning Chord of Calling and Devouring Light as the convoke spells in this deck. Since populate only shows up in this era, you’ll recognize most of the cards here if you’ve built a Trostani Commander deck. Seventeen cards make tokens and six cards besides Trostani populate. Particularly welcome given the trouble with the last deck is the higher availability of trample with Armada Wurm, Advent of the Wurm, and Giant Adephage. If they aren’t enough, Rogue’s Passage grants unblockability, while Archetype of Courage, Heliod, God of the Sun, Angelic Skirmisher, and Bow of Nylea can grant enough keywords to the team to get them through. Elspeth, Sun’s Champion makes tokens, wipes the worst of the board, and gives a super emblem to the team; it’s well-played in Commander and is no less powerful here. The pump in this deck comes from Archangel of Thune, which pairs beautifully with the lifegain from Trostani, Courser of Kruphix, and even Bow of Nylea. Archangel is probably the best choice from Chord of Calling, though Hornet Queen‘s good, too. With all these things and the balance of creature to noncreature spells, Primeval Bounty can do anything you need; I loved playing it in Standard as a way to get value out of top-decks, and it’s a big help to a deck type that struggles with top-deck value. If you wanted to lean more into Magic 2015‘s convoke spells, Obelisk of Urd rewards tribal decks, Return to the Ranks reanimates small creatures (and there are plenty of good ones in that Standard; Scavenging Ooze and Voice of Resurgence say hi), and Feral Incarnation can give a beefy Beasty board. Because Emmara, Soul of the Accord is a 2/2 on the ground that makes 1/1’s on the ground, her abilities don’t scream Brawl versus, say, Ghalta, Primal Hunger or even Huatli, Radiant Champion. But being a two-drop gives her a lot of chances to make lifelinking Soldiers, and the Selesnya always has room for more. Here’s the list in full. This build differs from a Selesnya-updated Huatli, Radiant Champion deck in two main ways: the convoke spells and Vehicles. Emmara wants to tap at every possible opportunity, so convokers like March of the Multitudes, Conclave Tribunal, and Venerated Loxodon help a lot. But it’s the Vehicles that hold the most interest, not only as repeatable tap opportunities but as ways of dealing damage that survive board sweepers, which is important for any Selesnya deck. Conqueror’s Galleon is a multiplayer all-star as it is; Weatherlight has twelve cards it can hit (not great, but serviceable); and Dusk Legion Dreadnought isn’t fantastic, but at least Emmara can crew it by herself. Teshar, Ancestor’s Apostle cares about the same set of historic cards as Weatherlight does, and it plus Bishop of Rebirth are the Sun Titans of the format; recurring Bounty Agent, Remorseful Cleric, Knight of Autumn, or stall-breaker Suspicious Bookcase works well. What separates the current Selesnya Standard from the past ones is the options for card advantage. Mentor of the Meek, Runic Armasaur, Conqueror’s Galleon, Weatherlight, and both planeswalkers provide extra cards; I couldn’t find room for Beast Whisperer. Dryad Greenseeker is a personal favorite in this deck, as it can find lands but also convoke early as needed. Harkening back to the Tolsimir Wolfblood days, it acts a little like Magus of the Library thanks to convoke – and who doesn’t want that? There are also a lot more good tramplers nowadays. Carnage Tyrant, Ghalta, Primal Hunger, and Forebear’s Blade are multiplayer stars, but the clutch card here is Conclave Guildmage, which can tap to give the team trample or to make a token. Put the trample and the card draw together, and I think this era of Selesnya will be the most consistent of the bunch in ending games. Three eras of Selesnya give three eras of convoke, but they each play differently. Eternal Brawl is a great way to trace guild development, and with the same mechanic running through all three decks, the Selesnya give a unique opportunity. As we’ve seen, though, the truly good convoke spells have been few; it looks like Guilds of Ravnica is providing the best depth of them. That suits me just fine!